When you’re living your best life in the Entertainment Capital of the World, the last thing you want is to spend hours in the kitchen just to get a decent meal. At Fresh n’ Lean, our prepared meal delivery service in Las Vegas makes it easy to enjoy healthy, nutritious food, without any hassle. Simply choose your ideal meal plan, and once a week receive a fresh batch of goodness delivered right to your doorstep. After adventuring through the Red Rock National Park or enjoying late night parties on the Strip, refueling your body with nutritious food is super important. Great news – our pre-made food delivery service in Las Vegas uses only organic ingredients. No GMOs, MSG, gluten, or preservatives in sight. Whether you’re a Vegas resident or you’re visiting Sin City for business or pleasure, you can have your organic meals delivered wherever you need – home, office or even your hotel room at the MGM Grand. Simply store them in the mini fridge and then pop them in the microwave when you are ready to feast. To light up your tastebuds brighter than the Bellagio fountains, our team of professional chefs uses a unique blend of whole-food ingredients. So you can experience the rich food experience of Las Vegas from the comfort of your own home. Everything is made fresh and low in refined sugars, fats, and salt. Healthy eating doesn’t have to be complicated. Simply place your order online and receive a specially designed box of ready-made meals each week that are individually sealed for freshness. Perfect for storing in the fridge or eating on the go – wherever America’s Playground takes you next. Vegas may be the legal gambling capital of the world, but one thing you don’t want to wager with is your wellbeing. At Fresh n’ Lean, our goal is to make your job easier and help put your diet on autopilot. Our delicious meal prep service in Las Vegas, NV makes it easy to enjoy wholesome, nutritious food that tastes as great as it makes you feel. Enjoy healthy and fresh meals delivered to your home or office anywhere in Las Vegas, Nevada. 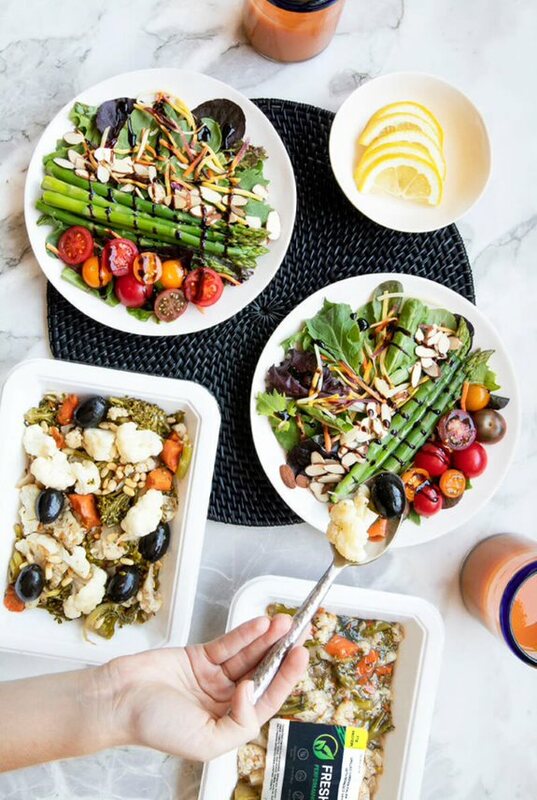 Food quality is something we’re super passionate about, which is why all of our prepared meals are made from scratch by our team of professional chefs and come completely free from artificial colors, flavors, and processed ingredients. And just because it’s healthy doesn’t mean it’s not delicious! Just like the Strip itself, our chefs take inspiration from a melting pot of international flavors. From Continental classes to Asian specialties, and everything in between. All delicious, and super nutritious. From the high-roller casino lounges to the Vegas Motor Speedway, the City of Lights is renowned for its fast-pace and high-stakes. Our dietitian-approved meals provide you with the clean fuel you need to keep a steady hand and a clear mind. So you can play your cards right and stay in the game. To get started today, simply select from our standard meal plans or select your favorite dishes from our A La Carte menu, and we’ll do the rest. At Fresh n’ Lean, we believe that everyone should have access to fresh food that tastes great and provides nourishment. That’s why we made sure our meal prep delivery service in Las Vegas caters for a wide range of dietary needs – gluten-free, plant-based, paleo and beyond. Whether you’re a native Las Vegan, here on business or visiting on vacation, we’ve got you covered. Our food delivery service delivers to wherever you need, once a week. Home, office, The Venetian hotel – you pick.